You’ve probably heard of top-down and bottom-up in context of business management. Project management has taken these management approaches and adapted it towards project planning. In this blog post, we’re going to explain the two approaches and their advantages as well as disadvantages. Project management has changed a lot since its modern beginnings in the 1950s. While traditional, waterfall project management dominated the discipline for a long time and is still widely used today, another methodology has emerged: Agile project management. The way project decisions are made and how the project is has also evolved. While top-down planning is still prevalent in many organizations, the bottom-up planning method is also widely used. Top-down is still a widely used approach to project planning. It means that any decisions and objectives come from upper management, who will then communicate this to the project manager, who in turn communicates the goals to the project team. In terms of project execution this means that the project manager creates a project plan first and then decides which activities and tasks the team has to do. The advantage of this approach is that decisions can be made and implemented very quickly. This is particularly important when time is limited. The other benefit of top-down project planning is that it helps align the project goals with the organization’s strategic goals as upper management is giving the directions. Top-down project planning has one big disadvantage: Because the team is not involved in the project planning, they might feel left out and as if they can’t voice their opinions. Furthermore, the prerequisite for top-down projects planning to work is that communication is clear. Unspecific requirements and expectations can quickly lead to misunderstandings which can ultimately result in the project failing. Remember that the team is not involved in the planning and thus, does not know the details of the project. It’s the project manager’s responsibility to communicate the goals that upper management has set. Bottom-up project planning means that it’s not upper management communicating the project objectives to the team, but the team identifies the project’s objectives and the corresponding tasks, which are then sorted into various activities and work packages. Based on the identified tasks, the project manager will create a project plan and schedule. The advantage of bottom-up planning is that the team members, i.e. the people who are actively working on the project, have a say in the project planning and decisions are made collaboratively. This will improve team communication and team building, and also empowers the team members. As a result it will motivate them to do their best to achieve the project goals. Identifying tasks first also leads to a more detailed project plan, with a potentially more accurate schedule. Because the project plan is much more detailed, the planning phase is much more time and effort consuming, compared to the top-down approach. 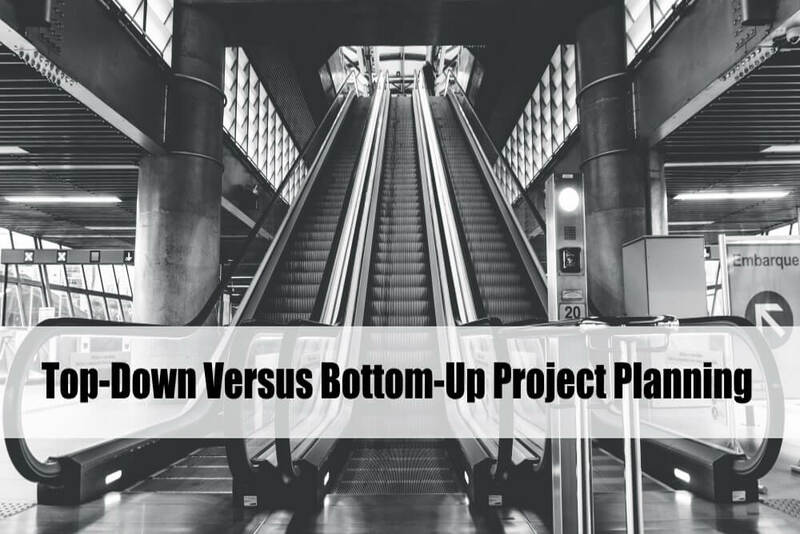 So bottom-up planning is not suitable for time sensitive projects. Bottom-up planning also requires a clearly defined scope and control process, otherwise it’s at risk of getting out of control. The best approach is to find a balance between the two approaches. For example, upper management will consult with the team to identify the project’s goal, but has the power to make the ultimate decision. How do you plan your projects? Let us know in a comment below. Want to get high quality project management, productivity and leadership articles, and InLoox news directly in your inbox? Sign up for the InLoox newsletter. Back to Basics (8): Top-Down Versus Bottom-Up Project Planning - InLoox • Copyright 1999-2019 © InLoox, Inc. All rights reserved.